A fugitive can become a folk hero — or a desperate criminal whose acts become more terrifying the higher the stakes become. Sometimes, they can be both at once. Here, we present five different cases of men who managed to elude the law for years, even decades, before finally facing justice ... or not. In 1996, a blast rocked Atlanta's Centennial Olympic Park, where thousands of spectators had gathered for a concert following a day of athletic events. Over 100 people were injured and two were killed as a result (one died on the scene; the other, a member of the media, died of a heart attack while running to cover the event). At first, the top suspect was Richard Jewell, a security guard who'd helped clear the area after discovering a suspicious backpack (stuffed with a 40-pound pipe bomb, as it turned out) before the explosion. 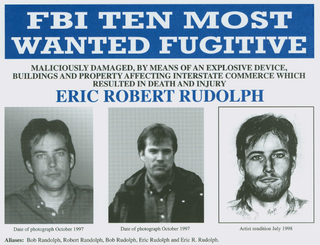 But the real culprit was Eric Rudolph, whose serial-bombing career was just getting started at that point. In January 1997 he set off two bombs in an Atlanta suburb, just outside an abortion clinic. In February, he was responsible for an explosion at a lesbian nightclub in northeast Atlanta. Both attacks caused numerous injuries. His crimes turned deadly again in January 1998 when he hit another women's health clinic where abortions were performed, killing a security guard and nearly killing a nurse. Based on his targets, his motive was fairly apparent, and it became completely apparent when he issued a statement after his arrest spelling out his anti-abortion and anti-LGBT views, and expressed zero remorse for his crimes, all four or which he confessed to. But the arrest took time; famously, Rudolph wasn't captured until May 2003, after the "most notorious American fugitive on the FBI's 'Most Wanted' list," per then-Attorney General John Ashcroft, had been dumpster diving around the fringes of western North Carolina for years. In 2005, he was sentenced to four life sentences plus 120 years. Of all the fugitives on this list, the least dangerous is likely Washington-born teenager Colton Harris-Moore, whose nom de crime was "the Barefoot Bandit." The ninth-grade dropout, who'd had a troubled childhood, didn't kill or injure anybody, but he did put plenty at risk with his antics, which included committing over 100 burglaries (often for food and other supplies to sustain his life on the run) and hot-wiring five planes, all of which he crash-landed. After two years eluding police and exponentially gathering Internet fame, the 19-year-old was captured, armed and aboard a stolen speedboat, in the Bahamas in 2010. "I am working with amazing people, and I will have a beautiful life ... If there is any truth I've learned, it is that absolutely anything is possible. When this is over and I regain my freedom, I will bring everything I am working towards into reality." In 2011, he sold the movie rights to his life story for $1.3 million, with the intention of using the money to pay back those he'd victimized. Another fugitive with an air travel connection ... but George Wright's crimes caused way more international intrigue than those of the Barefoot Bandit. He was known as "America's most elusive fugitive," and after 41 years at large, he'd built an entirely new life for himself in his adopted country of Portugal. Assisting with the capture of John Emil List in 1989 was maybe the most shining moment for long-running TV show America's Most Wanted. List had been enjoying his freedom for over 17 years ... until a neighbor happened to be among the millions that viewed an episode publicizing his gruesome crimes: in 1971 he shot his mother, his wife, and his three teenaged children, deliberately, carefully, one by one. He left their bodies arranged in ballroom of their New Jersey mansion, with religious music blasting, and moved to Denver before settling in Richmond, Virginia. He changed his name, married a woman who had no clue about his past, and — years later — was finally apprehended, having lived a quiet life since his murder spree. ... His life began to crumble. He lost the bank job, and a succession of subsequent jobs. By 1971, he was still leaving for work every morning, but — unknown to his family — he was unemployed and unable to pay the bills. He spent his days at the train station reading, napping, and wondering how to get his family out of their financial mess. He says today he felt he was letting the family down. "I grew up with the idea that you should provide for your family and to do that you had to be a success in the job that you had — or you're a failure, and that was not a good thing to be," he said. Finally, with the prospect of foreclosure threatening to expose his financial failure, List made his terrible decision to kill his family — but not himself. "It was my belief that if you kill yourself, you won't go to heaven," he said. "So eventually I got to the point where I felt that I could kill them. Hopefully they would go to heaven, and then maybe I would have a chance to later confess my sins to God and get forgiveness." A key factor in his arrest was a remarkably accurate rendering of List's age-progressed appearance, crafted for America's Most Wanted by Frank Bender, a forensic sculptor, and Richard Walter, a criminal psychologist. List died in prison in 2008 while serving the five murder sentences he'd been handed in 1990. Image collage via Le Point. America's Most Wanted is no longer on the air, but program host John Walsh recently dedicated an episode of his new show, The Hunt, to another family-murder case: that of Bradford Bishop, who is believed to have killed his mother, wife, and three children. This was in 1976, in Bethesda, Maryland; all died from blunt-instrument trauma (Bishop had purchased a ball-peen hammer the night of the killings). The bodies were driven some six hours away to a secluded area and burned ... and then Bishop, it seems, got the hell out of dodge. At the State Department, Bishop had postings in Italy, Ethiopia and Botswana, where his title was deputy chief of mission. Before entering the Foreign Service, he spent four years in U.S. military intelligence in the former Yugoslavia. He was fluent in French, Serbo-Croatian, Spanish and Italian. [Dancer and family friend Jacques] d'Amboise would note in his memoir that Bishop's mother was always vague about her son's jobs, and when he first learned of the murders, d'Amboise's early thought was that someone was exacting revenge for Bishop's work as "a spy." Whatever his true work, Bishop's career was a source of tension in the marriage, according to co-workers and Annette's neighborhood friends ... The family was having financial troubles, too; the IRS was auditing its taxes. The article touches on some of the more creative theories as to what may have happened to the Bishops, if the family patriarch didn't do it it; it also looks into the many sightings that've been reported of him over the years. As recently as last year, an unidentified body was exhumed to see if DNA would prove it was Bishop (it wasn't). In April 2014, Bishop was officially added to the FBI's list of 10 Most Wanted Fugitives; he's believed to be in Europe. To aid in the search, the FBI, which is offering a $100,000 reward for his capture, has produced a John List-style bust (pictured above) of what he might look like today.